The fourth day of the fifth and final test was all about Alastair Nathan Cook, the batsman. It was England's day to bat and 'The Chef' was expected to cook a special innings for one final time. He did so in stunning fashion as he and Root put on a mammoth 259 runs partnership, and thereby shutting any hopes of an Indian comeback. When Root and Cook departed in successive deliveries of Hanuma Vihari, it was only a mere consolation for India. The English crowd gave their most loved 'Chef' a magnificent standing ovation as he left the field for one final time, after a delicious 147. When Root called for a declaration when they had 464 runs to play with, it was all but over for India. India had to bat out 108 overs for an unlikely draw. It was unlikely considering the form of most of the Indian batsmen, barring the fantastic Virat Kohli. As expected, India lost Dhawan early. Pujara followed very soon and when Virat nicked one to Bairstow off Broad to be out for a golden duck, the Indian hopes of a rare draw had completely vanished as they were reduced to 2/3. The demons of 2014 came back to haunt Kohli, but luckily for India, it had come way too late in the series for Kohli to worry about. For the first time in this series, Rahul was partnering Rahane when India was in all sorts of trouble. They managed to play out the day but still needed to bat 90 overs to save the test. Having lost Pujara and Kohli, it was always going to be a herculean task. Come the fifth and final day of the test, and India started on a really positive note as Rahul got to his first ever fifty of the series and he was looking good for a lot more. Giving him company was Rahane who was settling in with each passing ball. The duo added 117 runs in a fairly quick time before Rahane got out to a poor sweep shot off Moeen Ali. Vihari was back to the hut in no time and the game seemed to have been done and dusted there, with India reeling at 121/5 and still needing to bat 70 overs for a draw. That is where the real action began. Pant joined Rahul in the middle and the two youngsters started to find boundaries at regular intervals. Rahul was particularly impressive as he hooked, reverse swept, and lofted en-route to his fantastic hundred and made India believe that a draw could be possible. He and Pant survived the first session by adding 40+ runs but still, they had an enormous task to do, to save the game for India. The post-lunch session saw something dramatic. England needed just five wickets to wrap up the game, and they were brimming with confidence to get the lower order of India in real quick time. But Rahul and Pant had completely different ideas. The two youngsters were highly positive in their approach as they found the boundary at regular intervals. As each over was completed, the target kept reducing to a great extent and the confidence of both the batsmen kept multiplying in geometric progression. The inswingers that were troubling Rahul right through this series, had suddenly become a no-problem as he exhibited his class. Pant was equally fantastic as he dominated the English bowling with some quality shots. He hit Moeen Ali straight over his head for a one-handed six and struck three fours in a single Stokes' over. Suddenly he had moved to 95, and India was doing something miraculous with this target. Batting on 95, he dispatched Rashid over the ropes as he showed no nerves of batting in the nervous 90s. He brought up his first ever Test hundred (First hundred by an Indian wicketkeeper in England) and looked good for an even bigger score. By this time, Pant had completely switched gears and was the more aggressive of the two. Rahul quietly carried on the good work as he milked singles and twos with an odd boundary and the target had reduced to just 166 when India headed to Tea. With 33 overs still left in the day, everybody had started talking about an Indian victory, which was completely unexpected a day before. This was the positivity that the New India under Virat Kohli was exhibiting (The near-perfect Adelaide chase in 2014 is the start). When Pant launched Rashid for a straight six right after the play commenced, it seemed to follow the similar script of the previous session and the nervous faces in the English camp were quite evident. After all, they wanted to win it for their most cherished 'Chef', as he was all set to bid adieu to this wonderful game. It also gave thoughts that an Indian win was certain, and Cook's farewell might be damaged by two youngsters. It was batting of the highest quality by both these batsmen as they brought up the 200 runs stand as well, with the run rate touching four at one point. With India needing just 140 odd runs to win and the second new ball too not being availed, India was right on top at that stage. But Rahul was castled by Rashid for a magnificent 149 with a ball that pitched outside the rough of the leg stump and turned viciously to take the off-pole, totally against the run of play. Pant fell for a fine 114 trying to break the shackles, and the game was lost for India at that point. Rahul and Pant never tried to be too aggressive nor were they too cautious in their approach. They played the right way and most importantly, played their natural game with the right balance. Though India lost, it was a treat for every Indian fan to watch these two go about their business in a professional way. If these two keep playing their natural aggressive game with the right mixture of defence as they exhibited at the Oval, India might have got a fantastic opening batsman and a delightful lower order batsman. The rise of these two batsmen is a definite positive for India, going forward. A confident KL Rahul and an aggressive Rishabh Pant will be two good positives for India going forward. With age by their side, this innings could well be the turning points in two of India's finest talents, and we could well hope for more entertainment from KL Rahul and Rishabh Pant in the days to come. Though India lost the Oval test, they have every reason to feel thrilled as they have unearthed the special abilities of these two capable players. For the moment, it is time to appreciate the fantastic efforts of KL Rahul and Rishabh Pant. It is also time to thank Alastair Nathan Cook for his delightful knocks, as he bids a goodbye to international cricket. 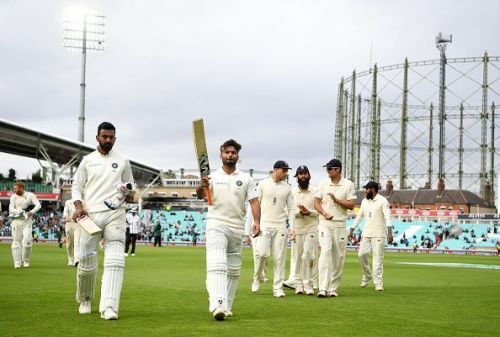 The Oval test will be mainly remembered for Cook's presence in English whites for one final time, Anderson going past McGrath to become the leading fast bowler in the history of Test cricket and for the heroics of KL Rahul and Rishabh Pant. Overall, it was one fantastic game to cap off this magnificent series!